Description/Additional Information: All Volunteer organizations assembled in the “break room” in the Birmingham VA Medical Center, completed the required documentation, received information on how to conduct ourselves throughout the medical center, and were given a list of floors to visit. 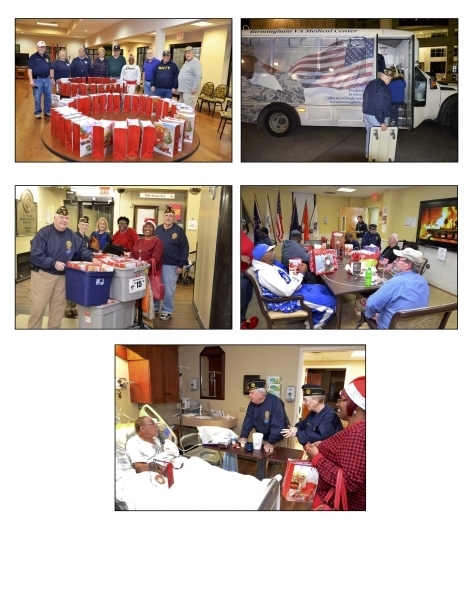 All Post 555 members traveled together and visited over 100 Veterans to present them with a gift bag of personal hygiene items and socks that were donated by Sherri Fuchs, and a Christmas card made by the students of Kingwood Christian School. They were all very appreciative and several carried on lengthy conversations with us if they felt up to it. We were in the medical center for three hours and every minute of time with these Veterans was well worth it. Great way to honor our Veterans during the Holiday Season.